Using electricity drawn from a wall outlet, refrigerators compress refrigerant to a high level of pressure, allowing it to expand when it reaches the evaporator coils. This, in conjunction with fans, removes heat from inside, keeping it cool. However, for it to do any of this, it needs a properly functioning compressor and motor. If something goes wrong with this core component, your refrigerator cannot work. 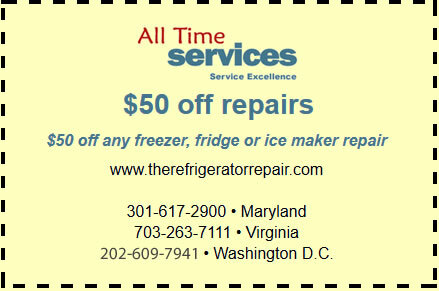 That’s why All Time Services offers a full range of refrigerator motor repair and replacement services in Virginia, Washington, DC and Maryland. If you live in the greater Washington D.C. area and notice that your refrigerator isn’t cooling properly or has simply stopped working, give us a call to set up an appointment with one of our experienced fridge repair technicians. Most refrigerator problems are fairly similar, however, when your motor starts to go, those symptoms may be more severe. Specifically, you should look for signs that the refrigerator isn’t cooling as it should be. Early on your refrigerator will generally try to compensate for the decrease in motor efficiency and operation. The compressor may run more often, sometimes not cycling off at all, just to keep the food in your fridge and freezer cold. However, as the appliance continues to run more often than it’s designed to, the added workload increases the likelihood of a complete breakdown. Other symptoms include a drop in efficiency, resulting in problems like food freezing in the refrigerator unit, condensation build–up on the outside of the unit, or excess icing or frost in the freezer. A lot of people assume these are normal signs of age in a refrigerator, but in most cases, the problem is related to a mechanical failure in the fan motor that can be resolved, but you should act fast. If you wait too long and allow your motor to break entirely, replacement may be necessary. If you think your refrigerator motor is about to break or if it has already stopped working, call All Time Services to have someone come out and inspect your refrigerator to determine the best course of action. Whether a simple repair is all that’s needed or the motor is beyond repair and needs to be replaced, we can get the job done fast. 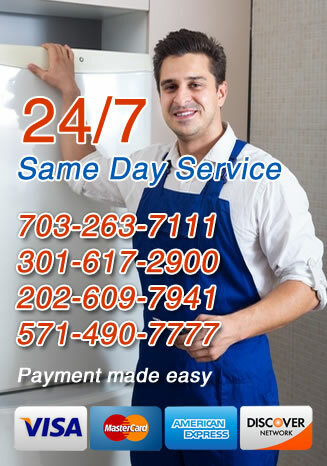 For quick and professional refrigerator and fridge motor repair service in Arlington, Virginia, Washington, DC and Maryland, Gaithersburg, MD and the surrounding areas, call us at the first sign of trouble.